Cottage cheese is made from curdled milk and whey, and is one of the best dairy sources of protein. A cup of skim milk cottage cheese contains 160 calories and almost 30 grams of protein, which builds lean muscle mass and helps you feel full longer. Cottage cheese is low in fat and carbohydrates -- just 2 grams of fat and 6 grams of carbohydrates. Cottage cheese can be part of a healthy weight-loss plan, replacing higher-calorie foods with a nutrient-dense, low-fat choice. Start your day with a cottage cheese breakfast smoothie. Blend fresh fruit, such as strawberries or bananas, with low-fat cottage cheese and water. Although a cup of low-fat cottage cheese may have the same amount of calories as a cup of low-fat plain yogurt, the yogurt has only 12 grams of protein, three times the amount of carbohydrates and twice as much fat as cottage cheese. Keep your blood sugar levels even by eating a snack or meal every three to four hours. Half a cup of cottage cheese with half a cup of fresh fruit contains less than 150 calories, but offers protein and fiber. Leave the skin on the fruit for added fiber. Fiber takes longer to digest, helping you to feel full eating fewer calories. Substitute low-fat cottage cheese for high-fat, high-calorie dairy items. Use cottage cheese instead of sour cream when making dips and spreads. 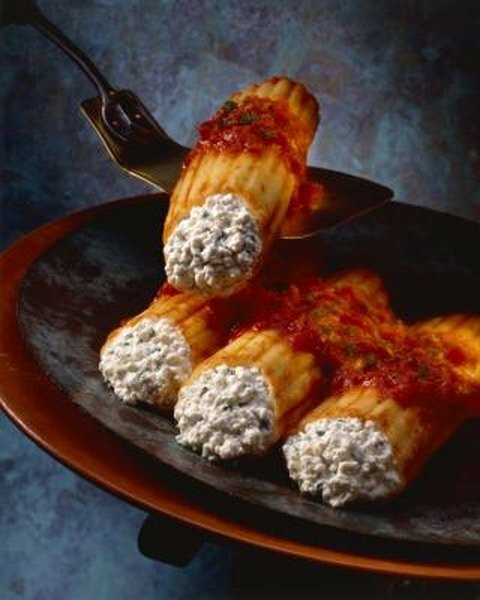 Replace ricotta and grated cheese in lasagna and pasta dishes with cottage cheese. Make egg, tuna or chicken salad with cottage cheese rather than mayonnaise. Make a dessert with cottage cheese. Add canned pumpkin, cinnamon, ginger and cloves to cottage cheese for a pumpkin pie pudding. Mix cinnamon, nutmeg and sliced apples with cottage cheese for a sweet treat. Cottage cheese can be made from skim milk or whole milk -- read the label carefully and choose low-fat cottage cheese for weight loss. Always consult your doctor before beginning any weight loss program. Make sure you eat cottage cheese as part of a calorie-controlled diet. While it contains nutrients that support healthy weight loss, simply eating cottage cheese cannot compensate for an otherwise poor diet and sedentary lifestyle. Make sure you get regulate activity through exercise, and consume fewer calories than you burn each day. Weight Loss: Cottage Cheese - A Dieter's Best Friend?